Heading to the VIVA Beauty awards tomorrow? Well don’t forget to stop and flash your fab manicure and arm candy at the mani-cam stationed on the red carpet. There will be a mani-cam, just like the one you see on E! TV during the awards show season. And it’s all thanks to N.Bar, the award -winning nail salon. 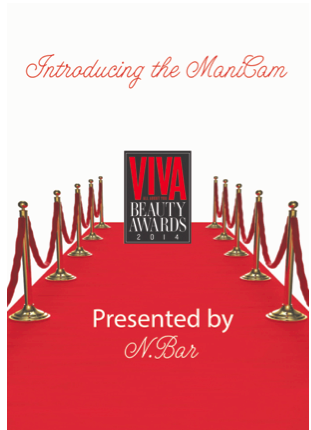 N.Bar has decided to bring the first ever mani-cam to Dubai’s red carpet, and it will be unveiled at the VIVA Beauty Awards on the 22nd of May. Exclusive to the event, the mani cam will allow guests attending to show off their fabulous manicures and gorgeous bling as they work the red carpet. It is a glamorous beauty awards event after all! N.Bar, the award-winning salon, loves anything to do with nails: not just because it’s their business, but also because it’s their passion. This passion has translated over the years into the latest trends in nail art, colors and products. The mani-cam is just another example of the ways in which N.Bar is pushing the envelope in this area by bringing back some Hollywood glamour to Dubai. And there is no better time to unveil the mani-cam but at an event that recognizes the best and latest products in this field. The Middle East's first brand for dedicated nail bars, N.BAR remains the region's pioneer of fast, hygienic and high quality professional nail treatments. Continuing to set industry benchmarks in every element of nail care and grooming, N.BAR's passion and dedication to the brand’s concept of ‘fast glamour for nails’ has helped create a truly unique experience within each of its seven prominently located branches. Working with world-famous brands including, Essie, Deborah Lipmann and Butter London polishes, and offering a host of treatments, therapies and enhancements for nails, N.BAR’s clients are women who demand efficient, high-end services and treatments in ultra hip and contemporary surroundings.